If you are unsure whether to get your Mum beauty products or chocolate this Mother’s Day, then I have found the perfect solution! Audacious and innovative, Sensation Chocolat Paris is a new skincare line, with natural Cocoa extracts, that brings beauty and well-being as it helps hydrate and preserve natural, beautiful and glowing skin. 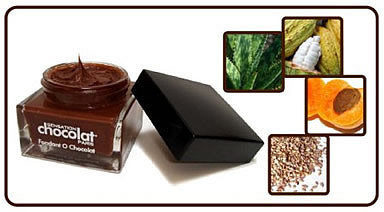 My favourite product from the range is the Fondant O Chocolat, which looks and smells just like chocolate!! It nourishes and provides long-lasting hydratation, bringing instant radiance to your face! It is quite pricey but sooo worth it. 原文：Sensation Chocolat - it's good enough to eat!